Since first opening in 1892, Grady Memorial Hospital has been committed to providing the best quality of care to all and serving the health needs of the most vulnerable. One of the largest public hospitals in the southeast and an internationally recognized teaching hospital, Grady's current annual service volume has grown to approximately 28,500 admissions and 566,175 outpatient services. 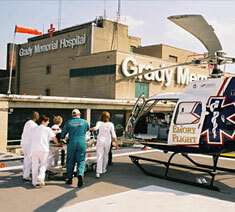 Emory's relationship with Grady began in the early 1900s, when the hospital's status as one of the main hubs of clinical teaching for the Emory University School of Medicine was established. That relationship evolved over time, and today, all doctors at Grady are either faculty or residents from Emory (approximately 80%) or Morehouse School of Medicine (20%). Dr. Sheryl Gabram has served as surgeon-in-chief for the Emory Department of Surgery at Grady since October 2011. She joined Emory's faculty in 2005 and began directing the highly successful Avon Comprehensive Breast Center at Grady, which offers a full spectrum of clinical and support breast care services, from screening and diagnosis to treatment and survivor care. She is also deputy director of the Georgia Cancer Center for Excellence (GCCE) at Grady, which is dedicated to expanding cancer care for medically underserved men and women in metropolitan Atlanta. While the Department of Surgery's long-standing programs at Grady are the Level I trauma center, surgical critical care service, and burn center, faculty of the Emory Department of Surgery are also developing and expanding surgical oncology, oral and maxillofacial surgery, vascular surgery, cardiothoracic, and plastic and reconstructive surgery services at the hospital. An overview of the Emory Department of Surgery's research programs.